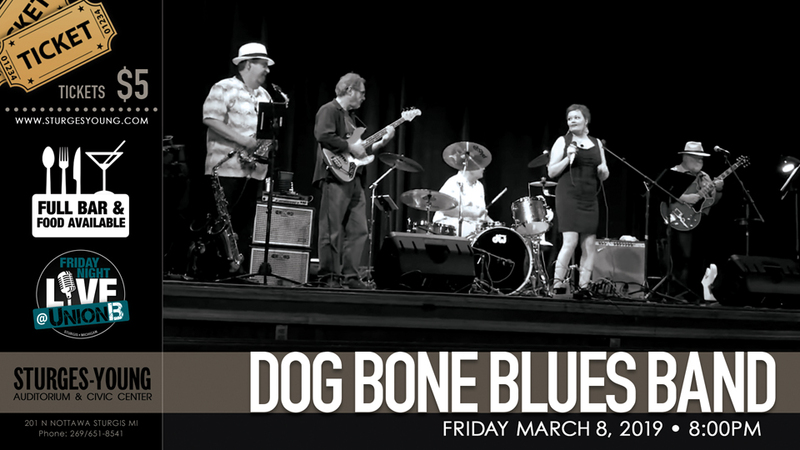 Sturges-Young Auditorium: The Dog Bone Blues Band is an exciting collaboration of seasoned musicians who love to play music, from Coldwater Michigan and the Kalamazoo area. The group covers various styles of Blues, Blues Rock, and Americana. Members include Dog Bone on drums , Jessica Rae Parris lead vocals, Bob Hunt on saxophone, Terry Oosterhart bass guitar and vocals, and Bob Weis on guitar and vocals.